It’s one of those super easy and super quick summer side dishes that goes perfectly with almost any meat or fish dish. I love the combination of veggies and fruits in a salad. It makes a salad taste a bit bitter, a bit sour, a bit sweet. Just perfect for a hot summer day. Wash the lettuce to remove all sand and soil grains from it and dry well. Do the same with the raspberries and dill. In the meantime, boil water in a small saucepan. Once the water is boiling, add the eggs and cook them for 7min. Take the eggs out, rinse them under cold water and set aside for 5min. Peal the eggs and chop each egg into 5 slices. Chop the dill. 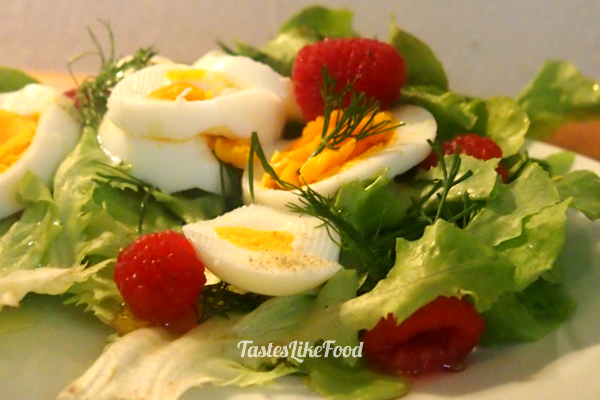 Toss together the lettuce, raspberries and eggs. Season with salt, black pepper and a spoon of good olive oil. Dress the salad with fresh dill.